One of our favorite Windows machines from last year was HP’s incredibly limber Spectre x360, a 13-inch laptop that could backflip into a tablet. 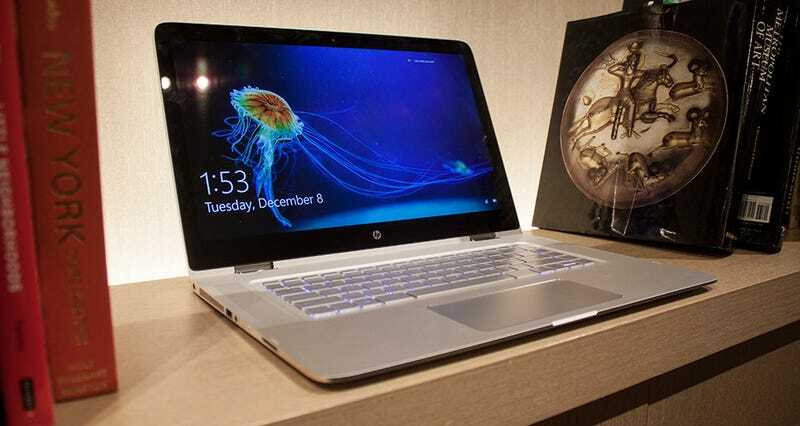 Now HP’s expanding on the idea, literally, with an all new 15-inch Spectre just announced at CES in Las Vegas. But size isn’t everything. The bigger Spectre makes big steps in two areas: display and speakers. This time around, the Spectre comes with 4K, making it an incredibly attractive option for video and photo professionals. But if you don’t need all those pixels, you can still just go with the full HD. HP’s made the wise decision to add twin Bang & Olufsen-tuned speakers on the top side of the device, flanking the keyboard. This pushes the audio at you instead of being buried underneath, and is particularly cinematic when folded into tent mode. But a larger Spectre x360 does make the laptop’s hybrid tablet capabilities a little bit daunting. Even on the smaller version, tablet mode was too big and bulky to be incredibly useful, and the 15-inch version only increases that awkwardness. But with the Spectre’s CNC aluminum chassis, coupled with a 4K and the latest Intel Core I processors all in a 16mm body, HP is gunning for premium, and they just might have something worth serious consideration. Keeping with the “going big” theme, HP is also sizing up the HP Pavilion X2 to 12 inches and slapping on a full HD+ display configuration. Considering they fixed what was wrong with the x2 last summer, this guy is simply the Pavilion’s bigger sibling. The 15-inch Spectre x360 will go on sale starting at $1,150 on February 14, and the 12-inch Pavilion x2 will have a much more manageable starting price of $500 and can be purchased a week earlier on February 7. Both will be initially available through HP.com.